If you haven’t heard of the Cat Daddy by now, you must not have cable (like me) or live in outer space. He’s this chill, rock n roll guy who has a show on Animal Planet, called “My Cat from Hell” where he helps pet guardians work through their cat issues. It’s a pretty cool show, although I don’t like the name. The title itself gives the impression that a cat’s poor behavior could be a result of their personality, when really it’s a result of the stimuli and environment around them. The author, a now famous “cat mojo” expert, shares his life's journey in parallel of rescue cats, while becoming clean from drugs and working at an animal shelter. This book was unexpectedly a heart-warming and encouraging book about following your passion to do what's right. I expected it to be full of mostly tips on how to live with cats, which it did have a few of those, too. Jackson shares his life story and how he came to be a cat mojo expert. The parallels he makes are deeply moving, which I shed a few tears on. It was an easy read that I finished in a few days, and came out the other side with a heart full of gratitude. Nothing really. A few more specific cat tips would have been nice. Everyone has their own struggles, during which animals show deep, unwavering love, even if they themselves are suffering. A lot of people choose to mask pain in life. Heck, even I have done this with alcohol a few times. You know, that drink "just to take the edge off of a stressful day"? Is it fear that we hold? Some are afraid to face the reality we live in, like Jackson did for decades. We all need to take a cue from his book, and realize we cannot shy away from the pain. That pang of guilt in your gut or tear in your eye you have when you see a malnourished, abused, and neglected animals is nothing compared to the physical pain that animal feels, yet they still express love during this pain. The difference is, we have the power to change their outcome. As Jackson said, the love we have for our own animal companion, bottle it and share it with all. This next quote, I find particularly helpful. I have personally noticed this in my own home with my tabby, Bailey. Why should you care about this book? 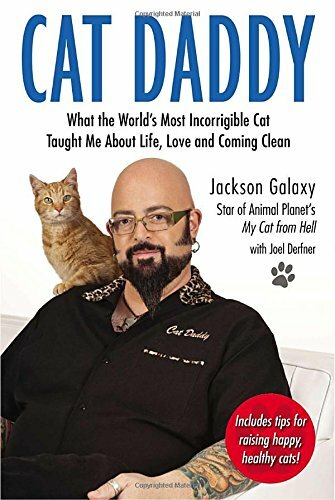 If you are someone who doubts your direction or worth in life, or you just love cats, then read this book. The moment of "Um....I can't remember what to say! Ah!" Amen to that, Jackson, Amen.